An account of the Canadian branch of this Reagan family, from which we draw heavily, has been given in Harvest of Memories: Sturgis and District…, 1900-2000. In that work, some members of the family are referred to as O’Reagan, a form which does not receive support from documents of the period. We have been told that there is, in addition, a genealogy of the Saskatchewan Reagans in existence, but have not seen a copy of such a work. We might note that the spelling Reagan, which (it is probably safe to say) is now generally regarded as the “standard” spelling of the name, was generally much less common in the nineteenth century than Regan, by which it is often outnumbered in contemporary records by ratios so high as 80 to 1. One also occasionally encounters such spellings as Reegan and Ragan in records of this period. We have also made much use of the commemorative website for the 2011 Reagan Family Reunion (see Some Sites of Related Interest at the end of this page). We are informed by Todd Martell that his great-grandmother, Katherine (Reagan) Martell (born 1884), claimed to be a second cousin of U.S. President Ronald Reagan; and other family members have also mentioned rumors to this effect. If indeed the present Reagan family had any real knowledge of Ronald Reagan’s antecedents, they may have assumed that the President’s ostensible great-great-grandparents, Thomas and Margaret (Murphy?) Reagan, of co. Tipperary in 1829, were the same as the Thomas and Margaret (McEntee?) Reagan, probably of co. Cavan in 1847, who founded the present line. But despite the lingering uncertainty surrounding the surnames of the two Margarets, geographical considerations alone argue against any connection, as Tipperary and Cavan are separated by about half the length of Ireland. Furthermore, Thomas Reagan of co. Tipperary was dead by 31 October 1852, while Thomas Reagan, probably of co. Cavan, was still alive in 1875. The tradition among the descendants of Patrick John Reagan that he had come from Mount Forest, Arthur Tp., Wellington Co., Ontario, is probably true, because Mount Forest is almost on the line between Wellington and Normanby Tp., Grey Co., Ontario, where Jan Ehresman discovered the Reagans in the 1852 census. 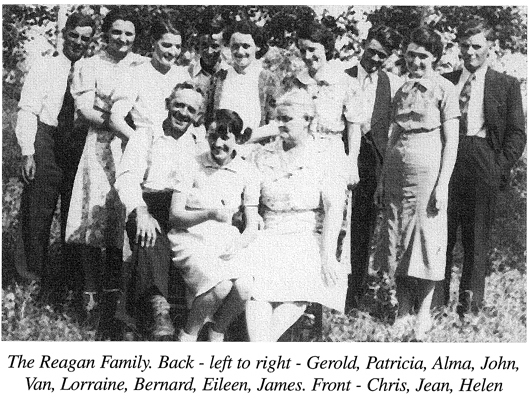 The Reagans were part of a nineteenth-century group-migration from Normanby to Manannah Tp., Meeker Co., Minnesota, which included the Heaney, Gibney and O’Brien families, with all of whom they were connected by marriage. Later, in the early twentieth century, the Reagans, Heaneys, and Gibneys became part of a second group- or chain-migration to Sturgis, Saskatchewan. Considering the longevity of the associations among these families in the New World, the possibility of connections between them predating their arrival in Canada is one which should be investigated. Prior to Jan Ehresmann’s discovery of the Reagans in the 1852 census of Ontario, probably the most compelling piece of evidence of a relationship amongst the Reagans of Manannah was that three of them were granted land on the same day, 10 June 1872, one of the Thomases (Bob Gerrish believes it was the younger one, his own ancestor) receiving the northeast quarter of section 28 in township 121N 31W in the 5th Principal Meridian, while Patrick and Bernard received the southwest and northeast quarters, respectively, of lot 8 in the same township. Later that year, on 25 September 1872, when John received land, it was one of the remaining quarters (the southeast) of the same lot 8, which is unlikely to have happened by accident. The other Thomas received the north half of the northeast quarter (thus only 80 acres) of lot 18 in the same township, on 10 February 1873. All named a son Thomas; in the case of Thomas, Patrick, and Bernard, it was the eldest son who was so named. Patrick and Thomas each had grandsons named Bernard, and Bernard named a son Patrick. Taken together, we feel these facts supply sufficient circumstantial evidence that these men were the four sons of Thomas and Margaret Reagan recorded in the 1852 census of Ontario. We cannot however claim to have tied together all the Reagans of Manannah. As pointed out to us by Jan Ehresman, who also provided the photograph at left, there is buried in the cemetery of Our Lady in Manannah, Meeker Co., a “John O. Reagan | born 15 October 1835 | Louthe County | Ireland | died | 1 May 1895.” A published transcript of the stones in the cemetery adds a note: “Veteran [of the] Civil War, Union soldier.” This man would be a poor match for the only John Reagan of this time period treated below, whose birthdate would appear to have been 18 August 1831. It seems unlikely that the month and year would both disagree if they were actually the same man. There are also a few other nineteenth-century Reagans in Manannah who do not appear to have been closely related, if at all, to those of whom we treat. References to the Academy of the Immaculate Heart of Mary, Coeur d’Alene, are so numerous in these notes that the name is abbreviated as IHM Academy. Mike Ransom, the editor of the alumni website for the Academy of the Immaculate Heart of Mary, Coeur d’Alene, Idaho, made some valuable suggestions concerning sources, and supplied copies of a number of documents. Al Calder, a relative of the Michael Mahoney (1863-1948) who married Elizabeth Reagan (1879-1947). We begin our account with a tentative identification of the Canadian immigrants Thomas and Margaret (____) Regan with an Irish couple of the same name. This section is greyed out pending the discovery of positive proof of the connection. Thomas Regan, married before 1839 (and before 1831 if she was the mother of all his children and they were the Canadian immigrants), Margaret McEntee. The collection of baptismal records at RootsIreland currently contains only five children for parents of these names, and although the records are found in two different counties, they plausibly all relate to the same family. Below, on the left, we list these baptisms, and on the right, provide commentary on the question of whether this couple was identical with the Thomas and Margaret (McEnter?) Regan who came to Canada (see entry no. 1 below). However, this identification is not decisively proven. There are certain differences which cannot be dismissed out of hand, and published transcriptions of the Canadian materials (the originals of some of which have not yet been examined) contain discrepancies. Note: in every case, the parents names are given as Thomas Regan and Margaret McEntee, so this information is not repeated below. So far, no baptismal records have been found for the oldest known children of the Canadian immigrants: John Regan, apparently born 15 August 1831, and Thomas Regan, apparently born 15 August 1836. Mary Regan, baptized 19 January 1839 in the Roman Catholic church, Kingscourt, co. Cavan, with sponsors Stephen McEntee and Rose Muligan. This child clearly died by 14 February 1847, when another daughter was given the name Mary, and thus died before Thomas and Margaret (____) Regan immigrated to Canada. Patt Regan, baptized 30 March 1840 in the Roman Catholic church, Kingscourt, co. Cavan, with sponsors Bryan Cavanagh and Ellen McEntee. Patrick John Regan, son of the Canadian immigrants Thomas and Margaret (____) Regan, was according to the 1852 census born 17 March 1841, and according to family tradition (which agrees exactly as to the date) was born 17 March 1841 at Dublin or Cork. Obviously this year is incorrect if he was the child baptized 30 March 1840; and the places traditionally named for his birth are far from co. Cavan. Published transcriptions of his marriage record, which is evidently very inaccurate, report the names of the parents as Timothy [definitely an error Thomas] Regan and Mary [definitely an error for Margaret] McEnter or McEasten. Bryan Regan, baptized 2 June 1842 in the Roman Catholic church, Kingscourt, co. Cavan, with sponsors Arthur Flyn and Margaret Brannen. Bryan Regan, son of the Canadian immigrants Thomas and Margaret (____) Regan, was according to the 1852 census born 2 January 1843, admittedly not a very good fit with this baptismal record, as it disagrees both as to the year and as to the time of year. As shown below, this Bryan, who was later known as Bernard, married a woman named Mary and went to Minnesota. He was almost certainly the Bernard Regan, aged 22 (grossly understated), called a son of Thomas Regan and Margaret McIntere in the record, who married in 1861 in Halton County, Ontario, Mary Rowan. This question is discussed further below. Alice Regan, baptized 9 February 1845 in the Roman Catholic church, Clogherhead, co. Louth, with sponsors Peter Reynolds and Susanna Regan. Alice M., daughter of the Canadian immigrants Thomas and Margaret (____) Regan, was according to the 1852 census aged “7 at next birthday,” implying a birth date of 1844-45. However, according to family tradition she was born in co. Cork, which is very far from Louth. Her marriage licence fails to name her parents. Mary Regan, baptized 14 February 1847 in the Roman Catholic church, Clogherhead, co. Louth, with sponsors Margaret Randals and Laurence Randals. No such child has been found in Canadian records. 1. Thomas Reagan (Sr.), of Normanby Tp., Grey Co., Ontario, and of Manannah Tp., Meeker Co., Minnesota, born ca. 1808 (aged “45 at next birthday” in 1852, aged 65 in 1875) in Ireland, of Irish-born but unidentified parents; alive in 1875 but probably not in 1880. He married (1) by 1831 (assuming her to have been the mother of his children), presumably in Ireland, Margaret McEnter (spelling of surname uncertain), born ca. 1810-11 (aged “42 at next birthday” in 1852), died by 1870 (no death registration found in Ontario). It seems likely that they were from Cork, which is said to have been the birthplace of their daughter Alice, and whence a somewhat vague family tradition also derives their son Patrick. They came to Canada some time after Alice’s birth, which was almost certainly in 1845, and were enumerated at concession 2, lot 39, in the 1852 census of Normanby Tp., Grey Co., Ontario, which gives Thomas’s occupation as farmer and the family’s religion as Roman Catholic; their children were: John (21), Thomas (16), Patrick (12), “Bryan” [recte Bernard] (10), and “Allis” [i.e. Alice] (7), all ages being “at next birthday.” A quirk of the returns for this township is to give for some persons the precise birthdays; in the cases of the present family they are given only for the sons, and imply (for what it is worth) the following exact dates of birth: John, 18 August 1831; Thomas, 18 August 1836 (same birthday as his brother John); Patrick, March 1841 (day not stated); “Bryan,” 2 January 1843. A directory published in 1865 lists “Thomas Ragan” at lot 39, concession 2 of Normanby. If he was related to the Michael Ragan listed in at lot 25, concession 14, in the same source, we have not discovered the connection. A list of rate-payers in Normanby Tp. in 1864 includes the names of Thomas, Patrick, and Michael Regan; we assume Thomas was the present man, and Patrick his son. Thomas Reagan went by 1870 to Manannah Tp., where he is listed alone, as a farmer, in the census of that year. He (2) between 1870 and 1875, Mary ____, born ca. 1824-25 (aged 50 in 1875) in Ireland, of Irish-born parents; alive in 1875. They are listed in the 1875 census of Manannah Tp., but have not been found in that of 1880. 2aJohn Reagan, of Meeker Co., Minnesota, born perhaps 15 August 1831 (aged “21 at next birthday — 15 August” in 1852, aged 38 in 1870, 46 in 1880) in Ireland. Bernard James Reagan, born June 1894. Thomas C. Reagan, born August 1896 in Washington. Alice Mable Caroline Reagan, born September 1898. Robert Emmett Reagan, born 1900. Mary Grace Reagan, born 1904; married Lee Whitson. Lee Andrew Reagan, born 1906, died in Norway. Ann Reagan, born 1859-60 in Minnesota, died 1 November 1925 at Los Angeles, California, and buried at Seattle, Washington. She married (1) John White, born 1858, died 20 June 1901 at Seattle. She married (2) Thomas Dervin. Issue by first husband. Christina Ellen Reagan, born 7 June 1862 at St. Paul, Minnesota, died 4 February 1937 at Upper Meadowdale, Washington, and buried in Calvary Cemetery, Washington. She married (1) 15 April 1883, Henry Rosenberg, from Stutgart, Germany, alive in 1889. She (2) by 1904, Milton Smith Bowen, born 21 April 1866 at Le Roy, New York, died 1 November 1942 at Omaha, Nebraska. In 1890 they took up a homestead in South Snohomish County, about 3 miles northeast of Bothell, Washington. In 1895 they sold the farm and returned to Washington. Issue by both marriages. Alice M. Reagan, born 1864-65 in Minnesota, died 22 November 1944 at Seattle, and buried in Calvary Cemetery. John Reagan, born 1866-67 in Minnesota. 2bPatrick John Reagan, said to have been born 17 March 1841 in Ireland, the place being given variously as Dublin or as co. Cork. Thomas Reagan, born 1861-62 in Canada West; a farm laborer in 1880. Patrick John Reagan, born 1863-64 in Canada West. Catherine Reagan, born 1864-65 in Minnesota. Alice M. Reagan, born ca. 1845 (aged “7 at next birthday” in 1852, aged 23 in 1870), in Ireland, according to family tradition at Cork, almost certainly the one of this name who died 3 May 1921 of a cerebral hemorage, and buried 5 May following at Surrey, Ward Co., North Dakota. If so, she married (1) 7 June 1867 at Richmond, Stearns Co., Minnesota, by licence issued in Meeker County, John Joseph Breen, born 19 March 1832 in co. Cork, Ireland, died 25 October 1917 at Williston, Williams Co., North Dakota, and buried 27 October following in Riverview cemetery, Williston, son of Hugh Breen and Mary O’Brien. Both parties were recorded as of Meeker County in the licence, and the witness to the marriage was (her brother) Patrick Reagan, who attested by mark rather than by signature. This couple was enumerated in the 1870 census of Manannah Tp. They were enumerated at Devils Lake, Ramsey Co., North Dakota, in 1900, where, according to Linda Thank, “they lost two female older children and maybe a few smaller ones to a diptheria epdemic.” They were enumerated at Williston, Williams Co., North Dakora, in 1910. They were apparently separated before his death, and her second marriage followed a month afterward. John Breen’s widow married (2) November 1917, by licence, Josiah D. Benell, then of Williston, born ca. 1859-60, who had been previously married with issue. In the application for the licence, his age was given as 56 years and hers as 57 years, which in her case would appear to be a considerable understatement. In 1920 they jointly purchased land in Williams County. Hugh Bernard Breen, born 19 March 1868 in Mannanah Tp., died 8 August 1932 at Williston, Williams Co., North Dakota, and buried there in Riverview Cemetery. He married 5 January 1905 at Saskatoon, Saskatchewan, Canada, Annie Elizabeth Regal (or Reagle), born 23 March 1890 at Huntingdon, Indiana, died 21 February 1930 at Williston. The lived in Saskatchewan until some time between 1909 and 1912, when they moved to Williston. They had ten children. Margaret A. Breen, born 1869 in Manannah Tp., died (unmarried) 15 March 1889 at Devils Lake, Ramsey Co., North Dakota, and buried there in Devils Lake Cemetery. Thomas Breen, born 19 August 1871 in Manannah Tp., died 15 November 1872. Mary Ellen Breen, born 20 May 1873 in Manannah Tp. Catherine Breen, born 14 February 1875 in Manannah Tp., died [unmarried] 5 January 1892 at Devils Lake, Ramsey Co., North Dakota, and buried there in Devils Lake Cemetery. Joseph Breen, born 3 January 1877 in Manannah Tp., died 11 September 1877 in Manannah Tp. John Breen, born 1879, died young. Patrick S. Breen, born June 1880 in Manannah Tp., died young. John Thomas Breen, born 16 September 1882 [recte 1881?] in Manannah Tp., died 4 April 1923. He married Mary E. ____, born 4 June 1885, died 2 July 1956 at Argyle, Minnesota. They had three children. Alice Isabella Breen, born 5 June 1883 in Manannah Tp., died young. Sarah J. Breen, born 6 June 1885, died young. Lucy (“Lu”) Theresa E. Breen, born 1 October 1887 at Devils Lake, Ramsey Co., N.D., died 18 May 1959 at Reno, Nevada, and buried there 21 May following in Mountain View Cemetery. She married (1) 31 July 1902 at Bottineau City, Bottineau Co., N.D. John Joseph Thank, born 25 August 1879 at Milwaukee, Wisconsin, died 12 February 1959 at Sandpoint, Bonners Co., Idaho. She married (2) 27 May 1922 at Wallace, Shoshone Co., Idaho, Edward Borland, and they lived at Reno, Nevada, from 1938 until her death. By her first husband she had five children, of whom John Thomas Thank was the father of Thomas Bernard Thank, husband of Linda (Sinrud) Thank, who has contributed this family record. Catharine Reagan, born 1877-80 (census ages inconsistent, or there was more than one child of this name), living 11 November 1922 as she survived her sister Anna. She was living unmarried with her parents in 1900, but was not longer in their household in 1910. As noted above, she must have married Oscar Anderson. Dennis Arthur Reagan, born 16 January 1881, died April 1978. He was still living unmarried with his parents in 1910, when he is called a farm laborer. He married Margaret (“Maggie”) Mae Wood, died 1980, daughter of Clement and Dosha Mae (Roach) Wood, of Eden Valley, Manannah Tp. They homesteaded in Canada for one year and then moved to Crosby, Minnesota. They had five children, including a son, Thomas Richard Reagan, still living (aged 75), whose daughter, Kathleen Margaret (Regan) Young, has supplied the information on his parents’ family. Mary Reagan, born 1882 (? ), died 1976. She was living unmarried with her parents in 1900, but was no longer in their household in 1910. As noted above, she married Sidney Scribner, born 1880, died 1956, whose obituary, dated 19 January 1956, mentions her as his survivor. They are buried together at Our Lady of Manannah, where there is also a Michael J. Scribner (1919-1978), possibly their son? Kathleen Joy Reagan, born 15 December 1946 in Meeker Co.; married Dan Kraus, of Wadsworth, Ohio. Lindsey Reagan, of New Hope; married Mary ____. Maureen Reagan; married Terry Young, of Wayzata. John Reagan, of St. Cloud, born 1915-16 (aged 4½ in 1920, 14 in 1930), alive on 4 June 2007, as he survived his brother Philip. Lucile Reagan, born 10 April 1913, died 10 February 1917, and buried with her parents. Lucile Reagan (called Mary in 1920 but Lucile in 1930), born probably in 1918-19 (aged 11 in 1930), alive on 4 June 2007, as she survived her brother Philip. She married ____ Dillon, of Eden Valley. Michael Peter Reagan, Jr. (see photo below), also of Manannah, born 14 July 1921 in Manannah Tp., died s.p.s. and possibly s.p. 19 November 2001 at Watkins, Meeker Co., aged over 80 years, and buried in the churchyard of Our Lady, Manannah. He married (as her second husband) 6 July 1963 in the Church of Our Lady, Manannah, Margaret E. Hanley, born 15 October 1922, who died 5 January 1998 at Grove City, Meeker Co., who had been previously married to ____ Hanley, by whom she had issue. Margaret Reagan, born 1924-25 (aged 5 in 1930), alive on 4 June 2007, as she survived her brother Philip. She married ____ Snyder, of Mantua, Ohio. John Reagan, born 1856-57 in Canada West; a farm laborer in 1870. Between 1870 and 1875 he and his brother Michael moved into their own household. John P. Regan, born Jan. 1884 in Canada. Elizabeth A. Regan, born 21 February 1886 at Glen Eden, Manannah Tp., grandmother of Luana Cowan. Leo Ragan, born April 1888, died in a glass factory accident. He has a son, Lawrence Richard Ragan Sr., who has a son Lawrence Richard Ragan Jr., alive in 2013. Mary J. Regan, born December 1890. 2b. Patrick John Reagan, of Sturgis, Saskatchewan, son of Thomas and Margaret (____) Reagan, of Normanby Tp., Grey Co., Ontario, and of Manannah Tp., Meeker Co., Minnesota, is said to have been born 17 March 1841, the place being given variously as Dublin or as co. Cork, Ireland, died 18 December 1913 at or near Sturgis, apparently aged 71 years, and was buried in St. Patrick’s Roman Catholic Cemetery. He married 10 February 1865 in Grey Co., Catherine Heaney, said to have been born 10 May 1841, in Ireland, perhaps at Dublin, died 11 January 1916, at or near Sturgis, apparently aged 74 years, and buried with her husband, daughter of Owen Heaney (Sr.), of Normanby Tp., Grey Co., Ontario, by his wife Mary Smith. A directory published in 1865 lists “Patrick Ragan” at lot 41, concession 2 of Normanby Tp., only two lots away from his father. At the time of their marriage both parties were of Normanby Tp. ; the record names both sets of parents in full, recording those of the bride correctly but giving those of the groom as Timothy [sic] Regan and Mary McEasten (or McEnter, depending upon the transcription). The actual name of the father of Patrick Reagan is, we feel, sufficiently borne out by the discussion given earlier in these pages; there is no such man as Timothy Regan or Reagan in early records of Grey County such as the 1852 census, nor is it credible that there could have been two men named Patrick Reagan living in Normanby Tp. at the same time who were both born in March of 1841. Family tradition states that Patrick Reagan and his wife were living at Mount Forest, Arthur Tp., Wellington Co., Ontario, when their eldest child, Thomas, was born in 1866; but while they may well have been there at an earlier date, U.S. census records show Thomas as having been born in the Minnesota. Patrick and Catherine moved shortly afterward to Manannah Tp., Meeker Co., Minnesota, where they were enumerated in the censuses of 1870, 1875, 1880, and 1900 (the 1890 census is lost for most of Minnesota). On 10 June 1872 Patrick Reagan was patented the southwest quarter of section 8, in township 121N, 31W of the 5th Principal Meridian, in Meeker County, consisting of 160 acres of land, while the northeast corner went to Bernard Reagan the same day and the southeast quarter to John Reagan a few months later. Patrick and Catherine Reagan attended St. Peter’s Roman Catholic Church at Eden Valley (which town lies partly in Manannah Tp., on the county line of Stearns and Meeker), and their names are inscribed in one of the stained-glass windows there. Timothy Gibney, a nephew of Catherine O’Reagan, went up to Canada (Saskatchewan wasn’t a province yet) and investigated homesteading. The next year the Gibneys, Fitzpatricks and Reagans, all related, sold their farms, and moved up to what is now the Sturgis area to homestead. Two of the Patrick O’ Reagan children, Anne and Elizabeth, with their husbands, remained at Eden Valley. The rest loaded up all their cattle, machinery, and other possessions and took the train to the outpost of Yorkton. The next fifty to sixty miles to their homestead, probably by horses and wagon, was a nightmare. They came in one of the wet cycles where every low spot was full of water. Black flies and mosquitoes were everywhere. The bridge over the Whitesand River had gone out. Story has it that Earl Laing helped them out by taking eighteen loads of furniture and belongings across the river in his boat. In all, they were about seventeen to eighteen days trying to get to their new land. The Reagan clan lived in sod houses for the first few years, probably on the quarter of land Patrick bought in 1903…. Patrick began working his homestead quarter [NE 26-34-4-W2] and by 1909 he had sixty-seven acres broke and in crop. He had proved up his homestead and received his patent on October 28, 1905. He built a 25×18 foot lumber house as well as some out-buildings. He and his family moved in April 1907. At least one, and probably several, of the Reagan daughters, were already married, and remained behind in the U.S. Patrick Reagan’s lands were the northwest quarter of section 13, in township 34, range 4 of the second meridian west of the Principal Meridian (NW 13-34-4-W2), and the northeast quarter of section 26 in the same township (NE 26-34-4-W2), where as noted above he built his homestead. He is found as “Patrick Ragen” at NE 26-34-4-W2 in the 1906 census, which gives the year of his immigration to Canada as 1904, and shows his livestock holdings as 3 horses, 15 “milch cows,” and 15 “other cattle.” A map of the Sturgis area issued ca. 1907 (?) by the Scandinavian Canadian Land Co. gives his name as Patrick Reagan. Patrick and his wife are found at the same location in the 1911 census. As noted in Harvest of Memories, “the group that came in 1904 were for the most part all living in the same vicinity,” and Patrick Reagan’s children mostly remained close by. 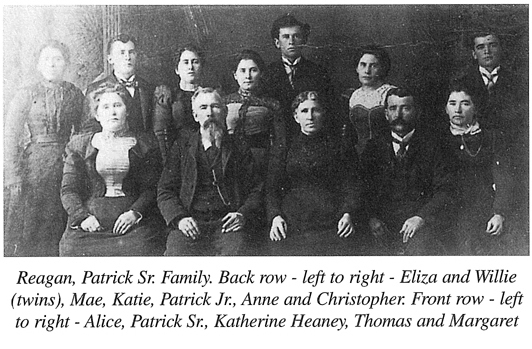 A photograph of his family, almost certainly taken in the U.S. before the family’s migration to Canada, is reproduced in Harvest of Memories, p. 622. 3Thomas Peter Reagan, of Sturgis, said to have been born 6 January 1866 at Mount Forest, Arthur Tp., Wellington Co., Ontario (although in all the extant censuses of Minnesota he is said to have been born in that state). Mary Reagan, born 1867-68 in Minnesota. She was a member of her parents’ household in 1880 but not in 1900, and we know of no evidence that she ever came to Canada. She is said to have married Robert MacNamara, but we cannot find anyone of this description in the 1900 census of Minnesota. George Edward Durham, born in July 1889 (per 1900 census), alive in 1933. He married (1) 1916, Julia Foley, from Eden Valley, Minnesota, born 1893, died 1928; and (2) 1931, Flora Walker Ganong, having seven children by his first wife and one by his second. Mary Etta Durham, born in February 1892 (per 1901 census), died 1905 in Canada, of typhoid fever, and buried on the family farm near Pike Lake. John Patrick Durham, born in Jan. 1893 (per 1900 census) in Minnesota, died 10 years at Manannah, of meningitis. Catherine Durham, died in infancy in 1895. Thomas Marshall Durham, born in September 1897 (per 1900 census) in Minnesota, died 1978. He married in 1919, Dehlia Jarbeau, born 1900 at Field, Ontario, died April 1974, and they had ten children. An interview with him, recorded in 1975, is printed in Harvest of Memories, pp. 822-25. Annie Reagan, born 1871-72 in Minnesota, died 1941 at Brown, Minnesota. She was a member of her parents’ household in 1880 but not in 1900. She remained in the U.S., and married (as his second wife) in 1900-04, Manus O’Keefe, born June 1859 (according to the 1900 census; aged 70 in 1930) in New York State, of Irish-born parents, died 17 June 1949 in Stearns Co., Minnesota, and buried in Our Lady of Mannanah Cemetery, Mannanah, plot 6, plausibly said to have been a son of Manus O’Keefe, Sr., and Julia Maloney, who were very close neighbors of Annie Reagan’s parents; his first wife is said to have been Mary M. Rafts. Manus O’Keefe appears as a widower, of no stated occupation, in the 1900 census of Mannanah Tp., with his sons John and Patrick by his first marriage. He and his second wife, Annie, appear in the 1930 census of Saint Cloud Tp., Stearns Co., Minnesota, in which his occupation is given as “none” (he being presumably retired). Three of their children were still unmarried and living with them at the time. In 1940 they were living with their son Sheridan. Florence Catherine O’Keefe, born 27 March 1905 in Minnesota, died 6 December 1971 at Freeborn, Minnesota. She was a sales-lady in a department store in 1930. She married Arnold Benedict Vorpahl, born 23 June 1901 in Minnesota, died 20 September 1973 at Albert Lea, Freeborn, Minnesota. They had issue. ____ Davis (daughter); married ____ Mulvihill. John DeWayne Davis, born 15 August 1927 at Litchfield, Meeker County, died 9 February 2008 at Minneapolis, Minnesota. He married and had two children, both married; but we do not have further details. Genevieve O’Keefe, born ca. 1907-08 in Minnesota, a finisher in a laundry in 1930. Gerold O’Keefe, born 1932-33 (aged 7 in 1940). Joseph O’Keefe, born 1934-35 (aged 5 in 1940). Colleen O’Keefe, born 1937-38 (aged 2 in 1940). Mary O’Keefe, born 1939-40 (aged under 1 year in 1940). Alice Reagan, born 1873-74 in Minnesota. She was a member of her parents’ household in 1880 but not in 1900. She married Bill Wood, but it is not clear whether this was in the U.S. or Canada. We cannot find anyone of this description in the 1900 census of Minnesota. 4Patrick Reagan, Jr., born 20 December 1876 in Minnesota. 5William John Reagan (twin to Elizabeth), born 23 June 1877 in Minnesota. Ezella “Zella” Marie Mahoney, born 3 March 1903, died 6 November 1962 in an automobile accident near Naples, Boundary County, Idaho, and buried in Olds Cemetery, Olds, Calgary Census Division, Alberta. She attended the IHM Academy, graduating in the class of 1922. She married in 1928, Alberic Sirois, born 7 May 1898 in New Brunswick, Canada, died 1966, son of Felix Sirois and Eliza Gagné. They lived at Olds, Alberta. They had issue. Edward L. Mahoney, born 2 July 1909 in Minnesota, died unmarried 3 April 1931 at Coeur d’Alene, of pneumonia, and buried there in Saint Thomas Cemetery. Catherine/Katherine G. Mahoney, born 2 December 1910 in Minnesota, died 6 September 1998 at Kirkland, Washington, and buried with her husband in Holy Cross Cemetery, Spokane, Washington. She attended the IHM Academy, graduating in the class of 1929, and later attended Northwest Business College, Spokane. She married 3 July 1933 at Spokane, Andrew “Andy” Davis Hottell, born 24 January 1907, died 6 November 1993, and buried in Holy Cross Cemetery, Spokane. They had six children. Thomas James Mahoney, born 2 September 1912 at Coeur d’Alene, Idaho, died 23 January 1988, and buried in Holy Cross Cemetery, Spokane, Washington. He married in 1937, Eileen Cecilia Glass, born 1914, died 1981. He attended the IHM Academy, graduating in the class of 1931. They had four children. Francis “Frank” John Mahoney, born 15 March 1914, died 20 January 1991, and buried in Holy Cross Cemetery, Spokane, Washington. He attended the IHM Academy, graduating in the class of 1922. He was in a relationship with a woman named Betty ____, and they may have had one child. 6Christopher Lawrence Reagan, born 5 August 1880 at Eden Valley. Colleen Delores Vedder, born 27 July 1937. She was a graduate of the IHM Academy in the class of 1955. She married ____ Fitzgerald, and was living in Spokane in 2014. Anna Marie Vedder, born 23 December 1942 at Coeur d’Alene. She was a graduate of the IHM Academy in the class of 1960. She married (1) ____ Borek. She married (2) (as his second wife) in 1972, Arnold “Red” Halpern, born 3 September 1924 at Brooklyn, New York, died 3 October 2003 at Kootenai Medical Center, widower of Ruth Irene Gisvold, and son of Morris and Rose (____) Halpern. He graduated from HS in Hutchinson MN, and held a BS degree in physical education from the University of Minnesota. He served two years in the Army. He was survived by a son Mike, but it is not known which of his wives was this son’s mother. Clarence Vedder, Jr., born 23 December 1949 at Coeur d’Alene He attended the IHM Academy for at least eight years (1955-1964), but did not graduate from there. He married Dawn ____, and was living at Cheney in 2014. Jerry Lynn Martell, of Highland, Maryland, father of Todd Martell. Judy Martell, a dental hygienist, who died in her thirties from breast cancer. She married Alan Mallow, deceased. They lived at Ontario, California. They had two daughters, Dena and Kari, both of whom are married and living in Southern California. Miss Gertrude Martell of Coeur d’Alene and Weaver Cotton of Kellogg were married Saturday at Coeur d’Alene. Mr. Cotton is the son of Mrs. Pearl McKinnis. He is a graduate of the Kelloff high school and is employed by the Bunker Hill. They will make their home in Kellogg. Carol Lee Cotton, born 12 December 1939 at Kellogg, Shoshone, Idaho, died 17 April 2017 at Fruita, Mesa County, Colorado. She married (1) 23 June 1956 at St. Alphonsus’ church, Wallace, Shoshone, Idaho, Earl Leroy Garren, born 29 October 1937 at Spokane, Washington, died 4 March 2010 at Coeur d’Alene, Kootenai County, Idaho. They had three children. She married (2) David Myron Pedigo, born 29 May 1940 at Denver, Colorado, died 21 February 2005 at Rapid City, Pennington, South Dakota. They had one child. Alice Adeline Martell, born 26 December 1921 at Sturgis (not in Kansas as has sometimes been stated), died 13 April 1981, and buried in the churchyard of St. Thomas the Apostle, Coeur D’Alene. She was a graduate of the IHM Academy, Coeur D’Alene, in the class of 1938. She married (1) 1943, Thomas S. Wilson, born 1916, died 1956. She married (2) in 1966, Lyle G. Pitner, born 1918, died 1983. Patrick Reagan, born 1898 at Eden Valley, drowned 1913 in May Lake, Saskatchewan. John Reagan, born 1900 at Eden Valley, died 1944 of lukemia. He married (as her first husband) in 1930, Ilene Berry, born 13 October 1905, living 1988, daughter of Fred and Alice (____) Berry, of Devil’s Lake, near Sturgis, Saskatchewan, formerly of Huddersfield, Yorkshire; she married secondly, John Kalenchuk, and had further issue. John Reagan and his wife lived on a farm northeast of Sturgis, and she moved to Sturgis after his death. They had two daughters: Doreen Reagan, who married Ray Wood; and Evelyn Reagan (d. 20 November 1986), who married Tony Carr. Margaret Reagan, born 28 February 1902 at Eden Valley, died 1997. She married 26 July 1926 in St. Patrick’s Church in Sturgis, Herbert Desroches, of Stenen, and had seven children. Their daughter, Yvonne (Desroches) Hawkins, contributed much of the information appearing here. George Reagan, born probably in 1903 (aged 3 in 1906 census), either died young, or else the son George said to have been born 1907 is misdated in family records. Leo Thomas Francis Reagan, born 29 August 1904 near Sturgis, died 28 February or 1 March 1971. He married Anne Homeniuk, died 1965. They had six children, including Gary Reagan, whose wife, Janice (née Starling), contributed some of the information appearing here. George Reagan, said to have been born 1907 (but see above), died 1922 of complications arising after a fall from a horse. Katherine (“Katie”) Reagan, said to have been born in November 1908, died 1982. She married 16 January 1934 at Sturgis, Alois (“Al”) Hauber, who came from Munich, Germany, in 1928, and they had two children. Katie Hauber was one of the charter members of the Sturgis Council of the Catholic Women’s League in 1949, and appears in a group photograph thereof taken at the time; she served as its President from 1969 to 1970. Robert Reagan, born 22 November 1912 near Sturgis, died 1987. He married 18 July 1939 in St. Patrick’s Roman Catholic Church, Sturgis, Bertha Lande, born 29 June 1915 at Moose Jaw. They had nine children. Marie Lenaya Chase, born 7 December 1925 in Siskiyou Co., California. Gordon Wilfred Chase, born 14 February 1927 in Siskiyou Co., California. 7Edward Glenn Reagan, born 22 November 1902 at Eden Valley. Duane Raymond Reagan, born 30 April 1928 in Los Angeles Co., California. Aidan Bryan Reagan, born 20 February 2005. Evelyn Patricia Reagan, born 14 August 2006. Robert Aloysius Rochefort, born 13 November 1926 in Siskiyou Co., California; presumably died young as he is not found with his parents in the 1930 census. Betty June Rochefort, born 28 June 1928 in Siskiyou Co.
Marcel Rochefort, Jr., born 27 January 1930 in Los Angeles Co., California. Alice Loretta Rochefort, born 25 August 1932 in Los Angeles Co.
Clyde Emmet Chase, born 10 January 1928 in Los Angeles Co., California. Cornelius (“Neilly”) Reagan, born 23 March 1911 at Sturgis, died March 1969 at Hawthorne, California. He attended the IHM Academy, Coeur d’Alene, Idaho, from 1923 to 1926. He was still living unmarried with his parents in 1930, when he was a factory-worker. He married ca. 1936,________. Patrick Anthony Reagan, born 1 May 1936. Donald Gene Reagan, born 30 September 1938. Robert Neal Reagan, born 15 February 1944. Jolene Marie Reagan, born 30 December 1955. Jennifer Marie Scott born 21 July 1963. Cameron Wilcott Edwards, born 8 April 1997. Coleman Michael Edwards, born 22 October 2001. Ian James Wilson, born 24 March 1977. Michelle Lovanna Wilson, born 12 December 1980. Aloysius Reagan, died in infancy in 1917. Barbara Ann Lickteig, born 9 May 1936. Lenaya Mae Lickteig, born 4 April 1939, died unmarried 22 June 1955 in Los Angeles Co., California. Josephine Loretta Lickteig, born 13 June 1941. Thomas Charles Lickteig, born 28 May 1943. Patricia Catherine Lickteig, born 24 November 1944. Dennis Neal Reagan, born 10 November 1949. Julia Ann Reagan, born 9 September 1952. Mrs. Reagan, 84, who lived at 821 Coeur d’Alene Ave., died Jan. 18, 1970 … after an illness of seven weeks. Reciting the Mass will be the Rev. Benedict J. Reagan, C.Ss.R. [Congregatio Sanctissimi Redemptoris], a son of Mrs. Reagan, and the Rev. Timothy Reagan, a grandson. Mrs Reagan … moved here from Saskatchewan, Canada. Mrs. Reagan was a member of St. Thomas Catholic Church and St. Thomas Altar Society. Survivors are five sons, the Rev. Benedict J. Regan, C.Ss.R., San Leandro, Calif., Thomas, Lawrence, and William A. Reagan, Coeur d’Alene, and Patrick J. Reagan, Seattle; four daughters, Mrs. Alice Reinhardt, Seattle, Miss Agnes Reagan, Spokane, Mrs. Warren E. Thorpe (Gertrude), Bellevue, Wash.; and Mrs. Richard Clements (Theresa), Boise; two sisters, Mrs. V.M. McKinnon (Helena) and Mrs. John Dahl, Tacoma; 30 grandchildren, 14 great-grandchildren, and numerous nieces and nephews. One son and two daughters preceded Mrs. Reagan in death. Angus William Reagan (called William Angus in the 1911 census), born in February 1902 (according to the 1911 census), died (unmarried?) 23 March 1925, aged 22 years, and buried 27 March following in the churchyard of St. Thomas the Apostle, Coeur d’Alene. Harry Richard Boesche, born 6 March 1932 at Spokane, died 6 December 1997. In 1952 and 1954 he was living with his father and stepmother (Myrtle) at W824 Jackson Avenue, Spokane, and he was employed by the U.S. Navy. He is still listed them at the same address in 1956 and 1957, but was then a student. He married 22 May 1970 at Las Vegas, Judith A. Walker, born 8 October 1940. At the time of their marriage both were resident in Virginia. As Harry R. Boesche Jr., born 6 March 1932, and Judith A. Boesche, born 8 October 1940, they are found at 26624 Manchester Avenue, Kent County, Washington, in 1992. Thomas Reagan, Jr., born 3 August 1930. He attended the IHM Academy from 1936 to 1944. Ronald Reagan, born 15 August 1933. He attended the IHM Academy from 1939 to 1944; the record gives his date of birth as 15 Feb. 1933. William Reagan, born 2 September 1936. He attended the IHM Academy from 1939 to 1944; the record gives his date of birth as 9 Feb., reversing the numerical values of the day and the month. Robert Reagan, born 18 August 1937. He attended the IHM Academy from 1945 to 1948. Jerry Reagan, born 2 February 1939. He attended the IHM Academy for one year, in 1946-1947; the record gives his name as Garry Reagan and his date of birth as 2 February 1938. Lanny Reagan, born 30 May 1940. She attended the IHM Academy for one year, in 1946-1947. Margaret Florence Reagan, born 28 January 1910 at Sturgis, died 23 June 1958, and buried 27 June following in the churchyard of St. Thomas the Apostle, Coeur d’Alene. She was a graduate of the IHM Academy in the class of 1928, and was still living unmarried with her parents in 1930, when she was a typist for a telephone company. She subsequently married ____ Johnstone (his name appears both in her death record and on her tombstone), but no husband is buried with her. Agnes M. Reagan, born 4 November 1912 at Sturgis, died (unmarried) in November 1985 at Coeur d’Alene, and buried in the churchyard of St. Thomas the Apostle. She was a graduate of the IHM Academy in the class of 1930, and was still living with her parents at the taking of the 1930 census. She was still of Coeur d’Alene at the death of her sister Alice in June 1976. She worked for the Shell Oil Company. Patrick John Reagan, of Seattle, Washington in 1979, born 1 December 1914 at Sturgis, baptized 17 March 1920 at Sturgis, died 1990. He was a graduate of the IHM Academy in the class of 1932. He attended the IHM Academy from 1924 to 1928, at least. He married 15 June 1940 in the church of St. Thomas the Apostle, Coeur d’Alene, Henny Ferguson, born 30 December 1915 at Anthony, Kansas, daughter of Richard Ferguson and Goldie Jumper. The marriage witnesses were Edward McMahon and Veronica Healy. They were living at Seattle at the death of his sister Alice in June 1976. They have a son, Kevin Peter Reagan, who married Rebecca Osborn. Rob Reagan, of Coeur d’Alene at his father’s death in 1979. Margaret Reagan, unmarried and of Coeur d’Alene at her father’s death in 1979. Melina Reagan, unmarried and of Boise, Idaho, at her father’s death in 1979. Pamela S. Reagan, baptized 5 August 1956 in the church of St. Thomas the Apostle, Coeur d’Alene. She married 15 October 1977 in the same church, Robert A. Gregg, son of Paul Gregg and Mary Jo Kotalski. 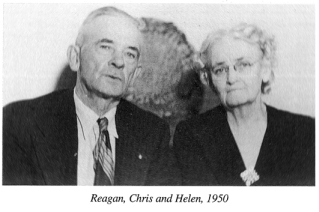 At the time of their marriage both parties were of Coeur d’Alene; the witnesses were Jerry Streeter and Margaret Reagan, and the ceremony was performed by the bride’s uncle, Benedict Reagan, C.Ss.R. They were still of Coeur d’Alene at her father’s death in 1979. Theresa F. Reagan, born 10 March 1919 at Sturgis, baptized 23 March following at St. Patrick’s church, Sturgin, died 1 December 2000 at Boise, Idaho. She was a graduate of the IHM Academy in the class of 1937. She married 26 April 1958 in the church of St. Thomas the Apostle, Coeur d’Alene, Richard Clements, Jr., son of Richard Clements Sr. and Hazel Tippon. At the time of their marriage both parties were residing at Boise, Idaho; the witnesses were Robt. Zimmermann and Marie Zimmerman, and the ceremony was performed by the bride’s brother, Benedict Reagan, C.Ss.R. They were also of Boise, Idaho, at the death of her sister Alice in 1976, at that of her brother Lawrence in 1979, and at that her brother William in 1990. Gertrude M. Reagan, born 21 [?] April 1921 at Sturgis, died in November 1986. She was a graduate of the IHM Academy in the class of 1938. She married 22 July 1944 at Seattle, Washington, Warren E. Thorpe. They were of Bellevue, Washington, at the time of her mother’s death in 1970, and at the death of her sister Alice in 1976. The Rev. Benedict (“Ben”) J. Reagan, C.Ss.R. [Congregatio Sanctissimi Redemptoris], born 9 October 1923 at Sturgis, ordained 29 June 1950 (according to his tombstone), died 12 September 1984 in Multnomah Co., Oregon, and buried in the churchyard of St. Thomas the Apostle, Coeur d’Alene. Benedict Reagan performed the marriage ceremonies of his sister Theresa, uncle Lawrence Reagan, and niece Pamela Reagan. He was of San Leandro, California, at the time of his mother’s death in 1970, of Portland at the death of his sister Alice in 1976, and of Great Falls, Montana, at the death of his brother Lawrence in 1979. (perhaps) Gwendolyn Reagan, died in infancy 24 September 1925, and buried 26 September following in the churchyard of St. Thomas the Apostle, Coeur d’Alene. However, this would raise the count of daughters who predeceased Mary Elizabeth (Madden) Reagan to three, while the latter’s death notice only accounts for two. Her death record does not state her parentage. William A. (“Bill”) Reagan … died Sunday evening at his Hayden Lake home after a year’s illness with cancer. He was 63. Born in Coeur d’Alene, he graduated from the Immaculate Heart of Mary Academy and the University of Idaho…. During the Korean War, he was called to active duty with the 149th Idaho National Guard Unit. After his service, he earned his law degree from Gonzaga University Law School. A lifetime Coeur d’Alene resident, Mr. Reagan began his law practice with William Hawkins and Eugene Miller. He then served two terms as Kootenai County prosecuting attorney before returning to private practice and specializing in corporate law. With Robert G. Templin and the late Joseph Haeger Jr., Mr. Reagan was a co-founder of Wester Frontiers about 30 years ago. They build the original North Shore Motel on the downtown lakefront where The Coeur d’Alene Resort is now located. The North Shore was sold … in 1983. Kathy A. Reagan, born June 1955, a graduate of IHM Academy in the class of 1973. She married by 1990, Russell Larson; they were of Coeur d’Alene at her father’s death. Michael E. Reagan, born November 1956, of Coeur d’Alene at his father’s death. Mary B. Reagan (twin to Nancy), born March 1958. She married by 1990, Kevin Kerr, and they were of Anchorage, Alaska, at her father’s death. Nancy Reagan (twin to Mary), born March 1958; unmarried and of Bellevue, Washington, at her father’s death. William T. Reagan, born June 1959, of Coeur d’Alene at his father’s death. Patrick Reagan, of Coeur d’Alene at his father’s death. Amy L. Reagan, born September 1960, unmarried and of Coeur d’Alene at her father’s death. Polly L. Reagan, born August 1964; married by 1990, Joe B. Stansell, born September 1961. They were of San Diego, California, at her father’s death, and have also lived at Redmond, Washington. Gerald Joseph Reagan, born 5 July 1909 in Saskatchewan, died 24 March 1970. Bernard Arthur Reagan, born 5 December 1910 in Saskatchewan, died 29 September 1977. He is believed to have lived at Flin Flon, Manitoba. A son, Doug Reagan, married Leona Bedrich, and is of Saskatoon; their eldest child is Terri Reagan, of Calgary, Alberta in 2002. Donna Jean Reed, born in August 1939 at Parma, Ohio. She married Dale Cassidy, born in December 1937 at Swift Current. They were living at White Rock, B.C., in 2000, and have three children. William “Bill” Reed, born in January 1942 at Parma, Ohio. He married in June 1977 at St. Catherine’s Catholic Church, Redondo Beach, California (marriage ended by divorce in 1983), Julie Folster, born in October 1956 at Ingelwood, California. He was living at Claremore, Oklahoma, in 2000. He has one child. David Reed, born in June 1943 at Parma, Ohio. He married in May 1963 in St. Joseph’s Catholic Church, Hawthorne, California (marriage ended by divorce in 1980), Rita Rose Richey, born in February 1944 at Hawthorne, daughter of Chester Richey and Rose Eleanor Underwood. Harvest of Memories says they have five children, but only lists four. As of 2000 had six grandchildren. Daniel J. Reed, born in September 1945 at Parma, Ohio. He married in January 1969 at Las Vegas, Norma Maki, born in January 1949 at Ingelwood, California. They have two children. Lance Olson, died by 2000. Alma Cecilia Reagan, born 14 July 1915 at Sturgis, died there 21 September 1980. According to Harvest of Memories, pp. 518-19, “She was educated ar Mannanah and Sturgis schools until Grade 8. She then worked at home and farms in the area.” Alma was a charter member of the Sturgis Council of the Catholic Women’s League in 1949, and served as its President from 1959 to 1961 and from 1971 to 1973. She married 17 October 1936 in St. Patrick’s Roman Catholic Church, Sturgis, Leo James Lubiniecki, born 1908 at Dauphin, Manitoba, died 1976 at Sturgis, Principal of the high school at Sturgis, son of Julian Lubiniecki, also of Sturgis. Alma and Leo are buried in St. Patrick’s Roman Catholic Cemetery, in the north part of the town. They have five children, for whom see the LUBINIECKI page. They were the grandparents of the present compiler. Judy Reagan, born about 1947. Harold James Lennox, born 9 September 1942 at Black Diamond, Alberta, died 26 July 1998 at Powell River. Robert Schiefele, alive in February 2019. After being demobbed from the Air Force following the Second World War, John reenlisted in the RCAF in 1947. He had a number of domestic and foreign postings in the course of his military career, including Winnipeg, Rivers, Manitoba, Washington D.C., Whitehorse, Ottawa and England. In 1968 he retired from the armed forces and moved to Calgary in 1969 to work for the Department of National Defense. Jean Francis Reagan, born 1 August 1924, living 2000. She worked at Kamsack, and at Flin Flon, Manitoba, for a few years prior to her marriage. She married 1946 in the Roman Catholic Church, Sturgis, Glen Milton Sando, born near Preeceville, died by June 1998 while on holiday at Crystal Lake, near Sturgis, son of Martin Sando by his wife Emma Carlson. Glen became the owner of a coffee shop at Preeceville in 1946. Later he opened Glen’s Clothing Store at Sturgis. In 1963 they returned to Preeceville, where Glen ran the dry-cleaning plant. Finally, in 1968, they moved to Calgary, where Glen worked for Eaton’s and finished his career as the owner of Palliser Insurance. Jean took her C.N.A. training and worked for a number of years. They have five children (for further details of whom see Harvest of Memories). Gerald “Gerry” Sando; married Barbara Murphy. They have two children. Greg Sando; married Gayle Kennedy. They have three children. Lynda Sando; married Gary Jacobs. They have two children. Tammy Sando; married Keith Eveleigh. They have four children. Paul Sando; married Pam ____. They have three children. Glenn Edward Reagan, born 26 March 1926 in Siskiyou Co., California, died in infancy. Richard Thomas Reagan, born 4 February 1946, apparently died young. Monica Lynn Reagan, born 16 April 1947. Mark Edward Reagan, born 29 March 1949. Melinda Rose Reagan, born 28 September 1951. She married ____ Kelly, and they were living at Kensington, Maryland, in June 2011. She is our informant for this family. Michael George Reagan, born 24 October 1954. Mary T. Reagan, born 18 November 1956, who died in a car accident as a teenager. Melissa A. Reagan, born 16 August 1958. Matthew J. Reagan, born 14 May 1961. Myles Reagan, born 13 April 1964. Rick Patrick Reagan, born 15 June 1951 in Los Angeles Co.
Shawn LaRee Reagan (female), born 16 November 1955 in Los Angeles Co.; married ____ Harrington. Casey John Patrick Reagan, Jr., born 15 August 1961 Los Angeles Co.
Riley John Reagan, born 3 March 1968 in Los Angeles Co.
Kathleen M. Reagan, born 14 November 1959 in Los Angeles Co.
Timothy J. Reagan, born 10 December 1962 in Los Angeles Co.
Christopher E. Reagan, born 7 December 1965 in Los Angeles Co.
Sharon R. Kunkel, born 3 January 1958 in Los Angeles Co.
Hugh E. Kunkel, born 11 October 1960 in Los Angeles Co.
Edy Diane Kunkel, born 10 August 1963 in Los Angeles Co.
Colleen E. Reagan, born 27 January 1958 in Los Angeles Co.
Shannon G. Reagan, born 14 April 1959 in Los Angeles Co.
Maureen T. Reagan, born 12 August 1965 in Los Angeles Co.; married ____ Tevis. 1. Harvest of Memories: Sturgis and District…, 1900-2000 (spine title: A Century of Memories), by the Sturgis and District History Book Committee (Sturgis, Saskatchewan: the Committee, 2000), 622-25, 662-66. 2. See Gary Boyd Roberts, Ancestors of American Presidents, 2nd ed. (Boston, 2009), 175-76. 3. R. Gibney, Irish-born Gibneys documented as of April 24, 1999, available online at http://web.archive.org/web/20021212123756/ http://us.share.geocities.com/Heartland/Cottage/1358/irishbirths/ irish001.html (warning: the file is 1.6 megabytes! ), points out that John and Ann [Heaney] Gibney, said to have been from the parish of Oldcastle, co. Meath, Ireland, had a daughter Jane who is enumerated in the 1871 census of Normanby, District 36, Subdistrict A, Division 3, p. 22. As Jan Ehresmann pointed out to us, the O’Briens are found in the 1851 census of Normanby. Yet another family which made the same move (but for whom no affiliation with the Reagans has been found) was that of Cody, for whom see The Cody Chronicles, available online at http://www.genealogy.com/genealogy/users/c/o/d/Cliff-Cody/?Welcome=1020910401. 5. Information from Linda Thank. 6. Harvest of Memories, p. 664; but the same work says Dublin at p. 622. Thos. Reagan     16  15th Augt. 8. Gazetteer and Directory of the County of Grey for 1865-6, by W.W. Smith (Toronto, 1865), available online at http://freepages.genealogy.rootsweb.com/~wjmartin/grey5.htm. 9. “Ratepayers in 1864,” in Arthur Walker Wright, Memories of Mount Forest and surrounding townships, Minto, Arthur, West Luther, Normanby, Egremont, Proton, in honor of the Diamond Jubilee of the Confederation of the Dominion of Canada and of the founding of The Mount Forest Confederate, 1867-1927 (1927? ), pp. 164-68, at p. 167. 10. Note, however, that a descendant, Bob Gerrish, author of a “Thomas Reagan Family History,” formerly available at http://www.dlux.net/~bobg/genealogy/thomas_reagan_biography.html, has never accepted our proposed identification, and believes that his ancestor came unaccompanied from Ireland at the age of 12 years. Mr. Gerrish’s statement to that effect was still standing as of 12 November 2011. Christina "     8 f    "
Alice     "     5 f    "
John      "     3 m    "
13. Bob Gerrish, “Thomas Reagan Family History,” cited above. Thomas Reagan was born in Drogheda, Ireland, on December 12, 1834 to Thomas Reagan and Anne Dunne…. He stowed away on a ship at the age of 12 and left for Canada…. He had a fight with his mom at the age of 12 and left home to live with an Uncle in Dublin. The Uncle paid his passage to America. He came to New York and stayed with an uncle (and his wife and children) in New York city. The uncle was fairly well to do, but died in a small pox epidemic and the aunt did not want her nephew by marriage staying, so he was on his own. He went to work at the Erie canal. He did not help in the construction, as that was finished in 1825, 9 years before he was born. Somehow, he ended up in Canada and that may be where he met and married Agnes Elizabeth McLean. Their first son Thomas was born in Canada in 1858. We must comment that not only is this scenario intrinsically unlikely, failing to account for the birth of Thomas’s eldest son in Canada, but such a birthdate is in significant disagreement with Thomas Reagan’s age in adulthood as reported in census records. 16. Ontario, Canada, County Marriage Registers, 1858-1869, abstract only, at ancestry.com. 17. And not Brunelle, as reported in an earlier version of these notes. 18. All the following information was provided by Linda Thank. 20. 1880 U.S. Federal Census, Minnesota, Meeker Co., Manannah Tp., p. 219 D, microfilm no. T9-0626 [FHL microfilm no. 1,254,626]. 21. 1900 U.S. Federal census, Minnesota, Meeker Co., Manannah Tp., Supervisor’s District no. 3, Enumeration District no. 106, sheet 5A. 22. 1910 U.S. Federal census, Minnesota, Meeker Co., Manannah Tp., Supervisor’s District 6, Enumeration District no. 96, sheet 9A. 23. Kurth, Ann, comp. Benton, Meeker, and Todd Counties, Minnesota Farm Directory, 1913-14 [database online] (Provo, Utah: Ancestry.com, 2000-), citing Minnesota Historical Society, Collection of Minnesota County Atlases, #175, Roll 8. 24. Unidentified obituary, presumably from a Minnesota newspaper, dated 19 January 1956, from information kindly supplied by Don Winter. 25. For accounts of him and his wife see Saskatchewan Cemeteries Project, Obituaries of people who are buried in the St. Patrick's Roman Catholic Cemetery, Sturgis, at http://www.rootsweb.a2-53 in Ontario (aged 8 in 1861), said to have been baptized 12 January 1853 at Guelph, Ontario, still alive in 1890. She married 14 November 1872 in Meeker County, ncestry.com/~cansacem/st_patrick_obits.html. 26. Eden Valley Journal, 30 November 1922, courtesy of Jan Ehresman. 27. Social Security Death Index; tombstone. 28. 1920 U.S. Federal Census, Minnesota, Meeker Co., Manannah, enumeration district 119, p. 5B. 29. 1930 U.S. Federal Census, Minnesota, Meeker Co., Manannah, enumeration district 21, p. 3A; roll 1106. Of these, the only consistent data is for the son John. Philip was missed altogether in 1920, and the child called Mary in 1920 must be the one called Lucile in 1930. 31. Death notice in Paynesville Press, __ June 2007, available online at http://www.paynesvillearea.com/news/Obits/archives/ june07obits.html. 34. Minnesota Death Index; Obituaries from The Paynesville Press, November 2001, available online at http://www.paynesvillearea.com/news/Obits/archives/nov01obits.html. 35. Social Security Death Index. name      relationship  age birthdate  cond. b.p. f.b.p. m.b.p. occ. John T. Regan      son   16  Jan.  1884 s  C. E.  C. E.   C. E.   farm lab. * C. E. = "Canada (Eng.)" + Perhaps an error for French Canada. 37. Information from Luana Cowan. 38. Information from Luana Cowan. 39. Information from Lawrence Richard Ragan Jr.
40. Harvest of Memories, p. 664. This date is in exact agreement with the age of “12 at next birthday — March” reported for him in the 1852 census, and in pretty good agreement with that of 25 years in his marriage record, and that of 30 years in the 1870 census. 42. Grey County marriage registrations, Archives of Ontario microfilm no. 1030056, per County Marriage Registers of Ontario, Canada, 1858-1869, ed. Elizabeth Hancocks, vol. 33 — Grey County (Agincourt, Ontario: Generation Press, n.d.) p. 95. The 1900 census corrently states they had then been married 35 years. The statement in Harvest of Memories, that they “married and immigrated to Ontario” is misleading, as Patrick had already been living in Ontario as an 11-year-old child. 43. Such a date would be compatible with her age of “20 at next birthday” as given in the 1852 census, and of 29 as given in that of 1870. It does not however quite agree with the age of 22 years given in her marriage record. 44. As noted in Harvest of Memories, pp. 374, 622, she was a sister of Anne (Heaney) Gibney, wife of John Gibney, of Minnesota, and mother of Timothy Gibney, who came to Sturgis. 45. Gazetteer and Directory of the County of Grey for 1865-6, by W.W. Smith (Toronto, 1865), available online at http://freepages.genealogy.rootsweb.com/~wjmartin/grey5.htm. 46. The series County Marriage Registers of Ontario, Canada, 1858-1869, ed. Hancocks, transcribes the name as McEnter, while Ontario, 1858-1869 Marriage Index (Family Tree Maker CD no. 266) gives it as McEasten. We have not checked the original record. 48. 1870 census transcription of Meeker County, Minnesota, transcribed by Erma Diane Rosenow, available online at http://www.rootsweb.com/~usgenweb/mn/meeker/meeker.html. 49. 1875 census transcription of the townships of Dassel, Kingston, Litchfield, Manannah, Swede Grove, and Union Grove, Meeker County, Minnesota, transcribed by Erma Diane Rosenow, available online at http://www.rootsweb.com/~usgenweb/mn/meeker/meeker.html. 50. 1880 U.S. Federal census, Minnesota, Meeker Co., Manannah Tp., Ennumeration District no. 50, Supervisor’s District no. 2, p. 6. 51. 1900 U.S. Federal census, Minnesota, Meeker Co., Manannah Tp., Ennumeration District no. 106, Supervisor’s District no. 3, sheet 5A. 52. Bureau Of Land Management - General Land Office Records, accession no. MN1910__.209. 53. Michael Nistler, The Valley of Eden (1986), from an extract kindly sent by Jan Ehresmann. 54. Harvest of Memories, p. 622. 55. Census of the Northwest Provinces [of Canada], 1906, Province: Saskatchewan, District 14 (Mackenzie), Subdistrict 27, p. , PAC R.G. 31 [microfilm no. T-18359]; duplicate entry at p. 14, with error of “Luddy” (or something of the sort) for the name of his wife. 56. “Scandinavian Canadian Land Co. Historic Map,” available online as part of the Kamsack, Saskatchewan, GenWeb Project, at http://www.rootsweb.com/~skkamsac/map/Tsp34-Rge4.gif. The date of the map is there given as ca. 1905, but this date is evidently too early. 58. Harvest of Memories, p. 624. 59. 1900 U.S. Federal Census, Minnesota, Meeker Co., Manannah Tp., enumeration district 106, p. 6A; roll T623_775. 60. See Harvest of Memories, pp. 344-45. 61. See Harvest of Memories, pp. 345-46. 62. See the research of her great-granddaughter, Cynthia (Vorpahl) Purcell, at http://trees.ancestry.com/pt/pedigree.aspx?tid=36860705. 63. Minnesota Death Certificates, ID no. 1949-MN-015792, per Minnesota Death Certificates Search, available online at http://people.mnhs.org/dci/Search.cfm. 64. These statement are made in a database by Anne & William Herndon, at http://www.wherndon.net/html/genealogy/, which misses the second marriage of Manus O’Keefe (the younger). Manus and Julia O’Keefe are enumerated next to Patrick and Catherine (Heaney) Reagan in the 1900 census; see 1900 U.S. Federal census, Minnesota, Meeker Co., Manannah Tp., Ennumeration District no. 106, Supervisor’s District no. 3, sheet 5A. 65. 1900 U.S. Federal census, Minnesota, Meeker Co., Manannah Tp., Enumeration District no. 106, Supervisor’s District no. 3, sheet 5B. 66. 1930 U.S. Federal Census, Minnesota, Stearns Co., Saint Cloud Tp., Enumeration District no. 55, p. 17A [microfilm reel no. T626_1131]. 67. For the dates see the research of their granddaughter, Cynthia (Vorpahl) Purcell, at http://trees.ancestry.com/pt/pedigree.aspx?tid=36860705. 68. RoAnn (Mulvihill) Wann, Perkins-Davis Family Tree, at Ancestry.com. 69. Michael Joseph Day, Day Family Tree, at https://www.ancestry.com/family-tree/tree/47519025/family. 70. Social Security Death Index. 82. Katherine Reagan Martell, Petition for Citizenship, no. 41332 (resulting in certificate no. 3998622), from a copy kindly supplied by Al Calder. 84. Leo Martell is named in the marriage records of his children Gerard and Gertrude. 85. See the entry for his granddaughter Darlene Vedder on the IHM Alumni website, at http://ihmacademy.com/1954.html#vedder. name              relat. age  birthpl. father           mother   occ. 88. Polk’s Coeur D’Alene City and Kootenai County (Idaho) Directory, 1936-37, p. 104. 89. Polk’s Coeur D’Alene (Idaho) City Directory including Kootenai County, 1938-39, p. 87; Polk’s Coeur D’Alene (Idaho) City Directory including Kootenai County Residents, 1940, p. 83; Ibid., 1947, p. 89; Ibid. 1949, p. 93; Polk’s Coeur D’Alene (Kootenai County, Idaho) City Directory, 1952, p. 103. 90. Idaho Marriages, 1878-1898; 1903-1942, vol. __, p. 42, IGI batch no. M00576-9, Family History Library microfilm no. 2,021,098. 91. See the entry for his daughter Darlene Vedder on the IHM Alumni website, at http://ihmacademy.com/1954.html#vedder. 92. Information without citation is from the entry for Darlene Vedder on the IHM Alumni website, at http://ihmacademy.com/1954.html#vedder. 94. Idaho Marriages, 1878-1898; 1903-1942, vol. 62 p. 26, IGI batch no. M01049-6, Family History Library microfilm no. 2,021,099. 95. Death notice from unidentified newspaper, reproduced in FindAGrave entry. 96. See the entry for Colleen Vedder on the IHM Alumni website, at http://ihmacademy.com/1955.html#vedder. 97. See the entry for Anna Marie Vedder on the IHM Alumni wesbite, at http://ihmacademy.com/1960.html#vedder. 98. See the entry for him at http://ihmacademy.com/obituaries.html#halpern. 99. See the entry for Clarence Vedder on the IHM Alumni wesbite, at http://ihmacademy.com/1968.html#vedder. 100. Polk’s Coeur D’Alene City and Kootenai County (Idaho) Directory, 1936-37, p. 104. 101. Polk’s Coeur D’Alene (Idaho) City Directory Including Kootenai County, 1938-39, p. 87. 102. Polk’s Coeur D’Alene (Idaho) City Directory Including Kootenai County Residents, 1940, p. 83. 103. Idaho Marriages, 1878-1898, 1903-1942, vol. __, p. 5; IGI batch no. M00576-9, Family History Library microfilm no. 2,021,098. 104. Idaho Marriages, 1878-1898, 1903-1942, vol. __, p. 6; IGI batch no. M00576-9, Family History Library microfilm no. 2,021,098. 106. Spokane Daily Chronicle, 24 January 1938, p. 5, col. 1. 107. See the entry for Alice Martell on the IHM Alumni website, at http://ihmacademy.com/1938.html#martell. 108. Harvest of Memories, p. 526. 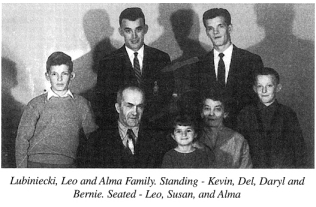 William Bernard Madden, a grandnephew of Bridget (Madden) Reagan, sent the following information on her parents: “John Madden was born in 1846 in Ballinasloe, County Galway, and arrived in Boston in 1871. He and Margaret Dillon were married in Roxbury (a suburb of Boston) on May 10, 1877. They then went to Eden Valley, where their first child Maggie was born March 3, 1878. She lived only a month and then Bridget was born on September 29, 1879.” In 1906 John Madden, aged 55 years and apparently a widow, was living with two children on the same section of land as his son-in-law Thomas Peter Reagan (14-34-4-W2). 109. 1900 U.S. Federal census, Minnesota, Meeker Co., Manannah Tp., Supervisor’s District no. 3, Enumeration District no. 106, sheet 5A. 110. Census of the Northwest Provinces [of Canada], 1906, Province: Saskatchewan, District 14 (Mackenzie), Subdistrict 27, p. , PAC R.G. 31 [microfilm no. T-18359]. 112. Harvest of Memories, p. 51. 113. See Buchanan History Book Committee, The Hands of Time: Village of Buchanan, 1907-1987, R.M. of Buchanan, 1913-1988, and district (Buchanan, Saskatchewan: Buchanan History Book Committee, 1988), 217-19. 114. See Harvest of Memories, pp. 336-38. 115. See Harvest of Memories, pp. 624-25. 116. See Harvest of Memories, pp. 406-7. 117. Harvest of Memories, p. 205 (where the photograph is reproduced). 118. See Harvest of Memories, pp. 662-64. 119. Cornelius O’Brien was born in “English Canada” and Mary Mullins at Providence, Rhode Island. 120. 1900 U.S. Federal census, Minnesota, Meeker Co., Manannah Tp., Supervisor’s District no. 3, Enumeration District no. 106, sheet 5A. 121. Census of the Northwest Provinces [of Canada], 1906, Province: Saskatchewan, District 14 (Mackenzie), Subdistrict 27, p. , PAC R.G. 31 [microfilm no. T-18359]. 123. School records, from extracts supplied by Mike Ransom. 124. 1930 Federal Census, California, Los Angeles Co., Long Beach Tp., Hawthorne City, Enumeration District no. 999, sheet 1A. 125. Information from Yvonne Hawkins and Jan Ehresmann. Harvest of Memories, p. 623, gives only a sketchy account of this family, which did not stay in Sturgis; this is our sole source for the existence of a son Lyndon who is said to have died in infancy. 126. 1930 U.S. Federal Census, California, Los Angeles County, Inglewood City, enumeration district 1003; roll T626_128, p. 1A. 128. Saskatchewan birth registrations, no. 3217. 129. 1930 U.S. Federal Census, California, Los Angeles County, Inglewood City, enumeration district 1021; roll T626_128, p. 19A. 130. California Birth Index; information from grandson, Sean R. Reagan, of Spokane, Washington. 131. Information from Sean R. Reagan. 132. 1930 Federal Census, California, Los Angeles Co., Long Beach Tp., Hawthorne City, Enumeration District no. 999, sheet 1A. 134. 1930 U.S. Federal Census, California, Los Angeles County, Inglewood City, enumeration district 1003; roll T626_128, p. 1A. 136. School records, from extracts supplied by Mike Ransom. 137. School records, from extracts supplied by Mike Ransom. 139. Information from her granddaughter, Steffanie (Scott) Edwards. 140. School records, from extracts supplied by Mike Ransom. 142. School records, from extracts supplied by Mike Ransom. 147. Mary Madden Reagan, Petition for Naturalization, no. 63991 (resulting in certificate no. 4092617), from a copy kindly supplied by Al Calder. 148. Idaho death records, 1935, no. 95754, Family History Library microfilm no. 1,530,930, transcribed oat FamilySearch, which gives the names of his parents in full as Patrick Reagan and Catherine Heaney, and the date of his death as 4 October 1935 and burial as 9 October following; however his tombstone gives 9 October as the date of death. 149. His and his wife’s tombstones, and those of several children, are transcribed in Kootenai County Cemeteries: St. Thomas Catholic Cemetery, R–S, available online at http://www.rootsweb.com/~idkooten/Cemeteries/StThomas/stthomrs.txt. 150. According to the death notice of his wife cited below says September, while her petition for naturalization says November. 151. The date given in her petition for naturalization. However, the 1911 census gives the date of her birth as March 1886. 152. Tombstone; death notice (cited below); month confirmed by Social Security Death Index. 153. Census of the Northwest Provinces [of Canada], 1906, Province: Saskatchewan, District 14 (Mackenzie), Subdistrict 27, p. , PAC R.G. 31 [microfilm no. T-18359]. 155. Mike Ransom, Academy of the Immaculate Heart of Mary, Coeur d’Alene, Idaho, available online at http://IHMAcademy.com/. The date of their move to Coeur d’Alene is taken from her death notice in the Spokane Daily Chronicle, cited below. 156. 1930 U.S. Federal Census, Idaho, Kootenai Co., Coeur d’Alene, Ward 2, enumeration district 11, sheet 4B; roll 401. 157. Death notice of Mary Elizabeth (Madden) Reagan, from an unidentified Coeur d’Alene newspaper, kindly supplied by Mike Ransom; punctuation revised for clarity. A briefer notice, but with a few additional particulars, appeared in the Spokane Daily Chronicle, 19 January 1970, p. A3, col. 4. 158. As listed in her petition for naturalization, with a few additional details taken from LDS patrons’ submission records. This family is not treated in Harvest of Memories. 159. Idaho Deaths and Burials, 1907-1965, vol. __, p. 20, IGI batch no. B00728-4, Family History Library microfilm no. 2,021,098. 160. U.S. Social Security Death Index. 161. Washington, Marriage Records, 1865-2004, at Ancestry.com. Their engagement was announced in The Evergreen [published by the State College of Washington, Pullman, Washington], 11 May 1923, p. 3, col. 3, an item kindly brought to our attention by Mike Ransom. 162. Washington, Marriage Records, 1865-2004 (index entry only), at Ancestry.com. 163. U.S. Social Security Death Index. 164. Death notice, Seattle Daily Times, from a copy kindly supplied by Mike Ransom. 165. U.S. Social Security Death Index, which however erroneously makes him a son of his father’s third wife, Myrtle J. Shipman. 166. Spokane, Washington, City Directory, 1952, p. 114; 1954, p. 98. 167. Spokane, Washington, City Directory, 1956, p. 81; 1957, p. 54. 168. Nevada, Marriage Index, 1956-2005, at Ancstry.com. 169. U.S. Public Records Index, 1950-1993, bolume 1, at Ancestry.com. 170. Saskatchewan birth registrations, no. 4058. The birthdate of 12 October 1905 ascribed to her in her mother’s petition for naturalization and in the U.S. Social Security Death Index is probably incorrect. 171. Death notice of Alice A. (Reagan) Reinhardt, Seattle Daily Times, 13 June 1976, p. 108, from a copy kindly supplied by Mike Ransom. 172. See the entry for Alice Reagan on the IHM Alumni website, at http://ihmacademy.com/ihmgraduates1925-31.html#reagan. 173. Idaho Marriages, 1878-1898, 1903-1942, vol. __, p. 38; IGI batch no. M00576-9, Family History Library microfilm no. 2,021,098. 174. Polk’s Coeur D’Alene (Idaho) City Directory Including Kootenai County Residents, 1947, p. 114. We are grateful to Mike Ransom for bringing this entry to our attention. 175. School Census, Kootenai County, Idaho, 1946; we are much indebted to Mike Ranson for this extract. 176. Collection: Idaho Deaths and Burials, 1907-1965, vol. 63, p. 24, IGI batch no. B01813-4, Family History Library microfilm no. 2,021,099. 177. See the entry for Margaret Reagan on the IHM Alumni website, at http://ihmacademy.com/ihmgraduates1925-31.html#reagan2. 178. Spokesman-Review (Spokane, Washington), 9 November 1985, p. A9, col. 1; month and year confirmed by Social Security Death Index. 179. Information from Mike Ransom. 180. Records of the church of St. Thomas the Apostle, Coeur d’Alene, searched by Mike Ransom. 181. Information from Rebecca (Osborn) Reagan. 182. Exact date from tombstone; month and place from Social Security Death Index. 183. Original church register, from a photocopy kindly supplied by Mike Ransom; briefer entry in Idaho Marriages, 1878-1898, 1903-1942, vol. 62, p. 23, IGI batch no. M01049-6, Family History Library microfilm no. 2,021,099. 184. Death notice, from an unidentified newspaper, kindly supplied by Mike Ransom. 185. Per her marriage record, cited below. 186. Original church register, from a photocopy kindly supplied by Mike Ransom. 187. Per her marriage record, cited below. 188. Social Security Death Index. 189. Original church register, from a photocopy kindly supplied by Mike Ransom; briefer entry in Idaho Marriages, 1878-1898, 1903-1942, vol. 62, p. 30, IGI batch no. M01049-6, Family History Library microfilm no. 2,021,099. 190. Social Security Death Index; her mother’s petition for naturalization gives the date of her birth as 2 April 1921, possibly dropping a digit. 192. Idaho Deaths and Burials, 1907-1965, vol. __, p. 20, IGI batch no. B00728-4, Family History Library microfilm no. 2,021,098. 193. However his school record gives his date of birth as 7 December 1927. 194. Death notice, Spokesman-Review (Spokane, Washington), 30 May 1990, p. C6, col. 1; Social Security Death Index. 195. Death notice, Spokesman-Review, 30 May 1990, p. C6, col. 1. 196. Census of the Northwest Provinces [of Canada], 1906, Province: Saskatchewan, District 14 (Mackenzie), Subdistrict 27, p. 14 (showing him with his parents) and p.  (showing him as the head of his own household), PAC R.G. 31 [microfilm no. T-18359]. The unusually large time-spread permitted for the taking of the census lead to it being riddled with duplicate entries. However, in this instance, the two entries were made only a few days apart, on 27 August and 24 August, respectively. 197. Western Land Grants (1870-1930), Library and Archives Canada, R.G. 15, liber 301, fo. 6 (microfilm no. C-6173). 199. Harvest of Memories, p. 51. 200. Harvest of Memories, p. 205. 201. Information from Terri Reagan. 202. Harvest of Memories, p. 205. 203. Ohio, County Marriage Records, 1774-1993, at ancestry.com. 204. Reed family tree, at https://www.ancestry.com/family-tree/tree/23200998/family. 205. See Harvest of Memories, p. 620. 206. Harvest of Memories, p. 205. 207. Harvest of Memories, pp. 518-19. 208. https://www.gedmatch.com/individual_detail.php?id_family=5693557&id_ged=P3831; Reagan family tree, at https://www.ancestry.com/family-tree/tree/107688905/family. 210. See Harvest of Memories, p. 687. 211. Idaho Marriages, 1878-1898, 1903-1942, vol. __, p. 32, IGI batch no. M00576-9, Family History Library microfilm no. 2,021,098. 212. 1930 U.S. Federal Census, California, Los Angeles County, Hawthorne City, enumeration district 998; roll T626_128, p. 12B. 213. Birthdates, where available, are from the California Birth Index. 214. All except last found in California Birth Index. The birthdate of the youngest child was supplied by his sister, Melinda (REagan) Kelly. 215. California Birth Index, and information from Shawn (Reagan) Harrington. 217. Death notice, Los Angeles Times, 11 November 2008.